A worked flint implement of uncertain form, possibly a fabricator or similar item, and perhaps of Mesolithic or earlier date. It is struck from a grey/brown flint that has dark red to brown patination on most surfaces, one face (ventral face?) preserving a heavily stained red/brown cortex. The object is roughly triangular in plan and cross-section, tapering to an elongated rod with blunt end that is sub-circular in cross-section. The dorsal face has relatively crude but invasive semi-abrupt flake removal, the blunt tip of the object also demonstrating multiple transverse flake scars. It measures 131.39mm in length, 84.68mm in width, 46.84mm in thickness, and 394g in weight. The precise funcion of this object remains uncertain, however the blunt and retouched end might indicate usage as a fabricator or similar item. 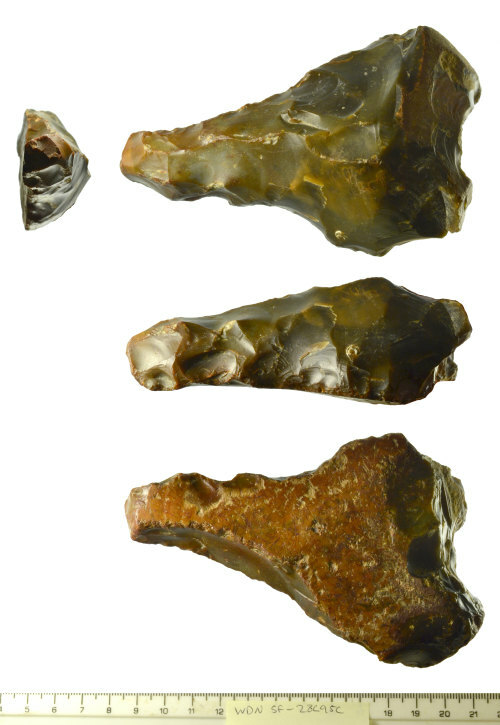 Its manufacture and patinated surfaces suggest it may date to at least the Mesolithic period (c.10,000-4,000 BC), if not earlier, although a later date range cannot be ruled out entirely.